Pyramids continue to fascinate us and spark many debates over how such enormous structures were built, from visiting aliens, slave labour to a paid dedicated workforce. What does remain is that these amazing structures were built to protect the Pharaohs body and wealth, and guarantee his soul’s safe passage into the afterlife. 1. In Egypt’s 1st Dynasty the first brick tombs appeared called Mastabas built for high officials. 2. Over 4500 years ago in the reign of King Djoser, the architect Imhotep is credited with building Egypt’s first Pyramid – the Step Pyramid at Saqqara. Begun in about 2630BC the Step Pyramid is the oldest stone structure of its size in the world. 3. Snofru, the first king of the 4th Dynasty built at least two true straight sided pyramids for himself. The Bent pyramid is one of these, so called because half-way up its height changes angle sharply. 4. There are four little known pyramids at Abusir and were not constructed very well. The smooth limestone casing blocks that once covered the rough masonry have been stripped off many years ago to be reused in other buildings. The few remaining decorated reliefs show a very early scene of sea-going ships in Egypt and another detailing the animal booty captured from the Libyans including 243,668 sheep and 123,440 cattle. 5. The one pyramid that is known to all is of course the Great Pyramid of Khufu at Giza. Its ancient name was “The Pyramid which is the place of Sunrise and Sunset.” The original height was 146m and remained the tallest building in the world until the construction of the Eiffel Tower in 1889 and covers an area of 2300 sq m and is the only remaining original wonder of the world. 6. It took 6.25 million tonnes of stone to build the Great Pyramid with the individual blocks weighing between 2 and 15 tonnes and if every stone was laid side by side there would be enough to surround France! To stand in front of this structure strikes you in wonder at how this amazing feat was carried out especially when you think that the blocks must have been produced at a rate of one every two minutes each day for 23 years. 7. The tomb of Khufu’s mother, Queen Hetepheres, lies beside the causeway of the Great Pyramid and a Canopic chest with her vital organs was discovered but the sarcophagus was empty. However it seems ones mother was just as important in ancient Egypt as now! 8. 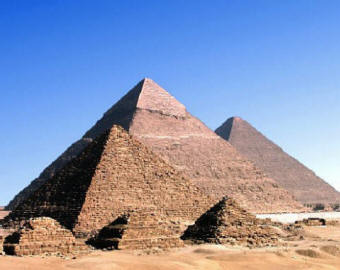 The pyramid of Khafre appears larger than Khufu’s but was built on slightly higher ground and so gives that impression. It is the most complete of the Giza pyramids and with its original limestone gives us an idea of how impressive these tombs would have been with the polished stones completely encasing the pyramid. 9. The Sphinx is Egypt’s earliest royal statue and formed part of Khafre’s pyramid complex and most Egyptologist’s think that the statue was built from an outcrop of limestone rock that remained after the quarrying for the Great pyramid. This act has given us one of the most iconic statues in the world. Its lion body symbolizes power and its head seems to be of Khafre himself. 10. In the New Kingdom the building of pyramids was abandoned in favour of tombs in the Valley of the Kings. Yet the desire for this elaborate tomb was then revived by the Kushite Kings of the Twenty-fifth Dynasty. They were more modest in size and along with the kings there are 14 queens also buried at el-Kurru. The magic of the Ancient Egypt pyramids continues to enthral us and you will certainly never forget the moment you stand before the Great Pyramid at Giza and is certainly a “bucket list” experience.